Alpinestars The Express Drystar Overpants are designed for wear over casual pants to provide effective protection against abrasion and impacts, as well as 100% waterproof performance when riding in adverse weather. A removable thermal liner ensures comfortable riding in cooler conditions, while a long zippered gusset makes fitting and removing the pants while wearing boots quick and easy. EXPRESS DRYSTAR® OVERPANTS KEY FEATURES: • 600 Denier fabrics with PU coating main construction with reinforcement material on knees and seat areas. 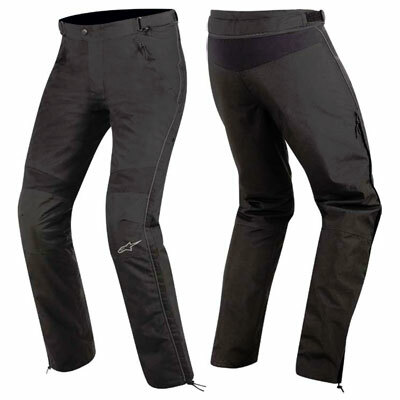 • Pre-curved leg design affords a superior riding fit. • Waterproof and breathable Drystar® membrane ensures excellent all-weather capability. • Removable thermal liner ensures high levels of comfort when riding in cooler conditions. • Ergonomically tapered PE comfort padding on the hips. • CE certified armor on the knees provide high levels of impact protection. • A long zippered gusset running from the knees to the hem enables easy fitment of the pants while wearing boots. • Reflective piping for enhanced night-time visibility. • Waist connection zipper allows attachment to selected Alpinestars leather and textile jackets. • Adjustable waist with secure sliding hook closure. • Premium YKK® zippers.